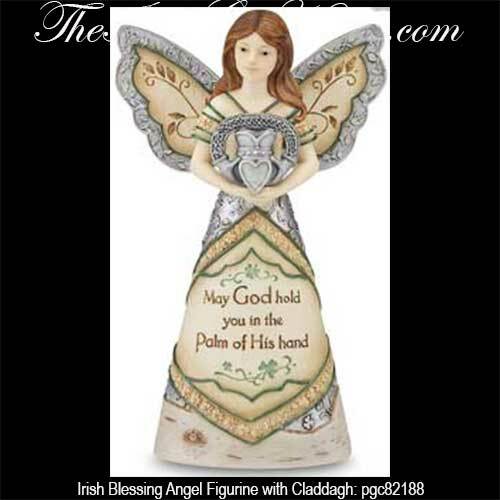 This Irish angel figurine features the Claddagh along with an Irish blessing. This Irish angel is holding the Claddagh and is enhanced with an Irish blessing along with shamrocks and Celtic knot-work accenting. The Irish angel figurine features a colorful resin design and measures 6 " tall with a 4" wide wingspan; she also has felt pads on the base. The Irish blessing angel is gift boxed with Claddagh, Celtic knot and shamrock history cards, compliments of The Irish Gift House.